Favourite Foods: Pizza, Burgers, Tacos - basically, all fast food! Kurt Wagner has a demonic appearance but is actually the sweetest, most vulnerable and human of the group. He is quick to pick up on others feelings and will comfort them if necessary and is himself, quite shy and sensitive. Because of his appearance, Kurt feels very isolated from people but instead of brooding over his situation, he always plays practical jokes, especially on "big brother" Scott and is generally always jolly to mask his biggest fear of being rejected as a freak. He is afraid no-one will be able to love him. Due to a holographic inducer, Kurt can attend Bayville High, but still continues to live in fear of his inducer breaking and having the other students finding out about his true appearance and labeling him a total freak. Also, because his holographic inducer is purely visual, Kurt always must be careful about coming into contact with people so that they do not feel his fur, making him feel even more isolated. Nightcrawler is a swashbuckler who excels at soccer and gymnastics due to his mutation and tail. This makes him the team member with the greatest zest when approaching, sometimes dangerous, situations and always gives his all and performs with courage. Friends and Love Interests - The people that Kurt has bonded with most over the course of the two seasons. There are, in fact, quite a number - he's obviously a very popular furry elf! Kitty - At first, she was repulsed by his appearance, but gradually Shadowcat grew to like Kurt greatly and care about him too (for example, her worry for him in Rogue Recruit). I would say that they are most probably best friends. Scott - He is like Kurt's big brother, the elf loves to play tricks on him but respects and likes him as the leader of the team. Evan - They like to play jokes on other team members together and seem to get on quite well. Kurt especially seemed sad with the prospect of Evan leaving the Institute in African Storm. Amanda - Kurt's girlfriend. She accepts what he is fully and loves him for it. Enemies - The people that Kurt does not particularly like. Mystique - She is Kurt's mother but in his eyes, whether she was forced to or not, is fully to blame for him being abandoned at birth. 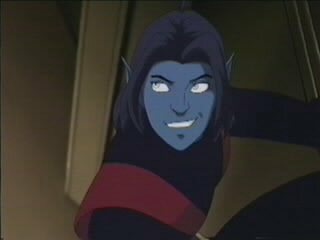 History on Evolution - We first met Nightcrawler in the very first episode of X-Men: Evolution (Strategy X) when he arrived at the Institute covered by a cloak. His initial insecurities were relieved somewhat after acceptance by Scott, Jean and the Professor and the gift of his holo-watch. After that introduction, Kurt became a jolly and fun character, always approaching battle with enthusiasm and bravery, for example, approaching Rogue in Rogue Recruit. A significance occurrence for Kurt, was in Shadowed Past when Mystique confessed that she was his mother and this, obviously confused him greatly - however, Nightcrawler continued on at the Institute and has since found full acceptance with himself and his appearance in Shadow Dance when a girl called Amanda revealed she knew what he really looked like and approved.